Note: Version 2.0 requires iOS 7! Test and train your photographic memory! 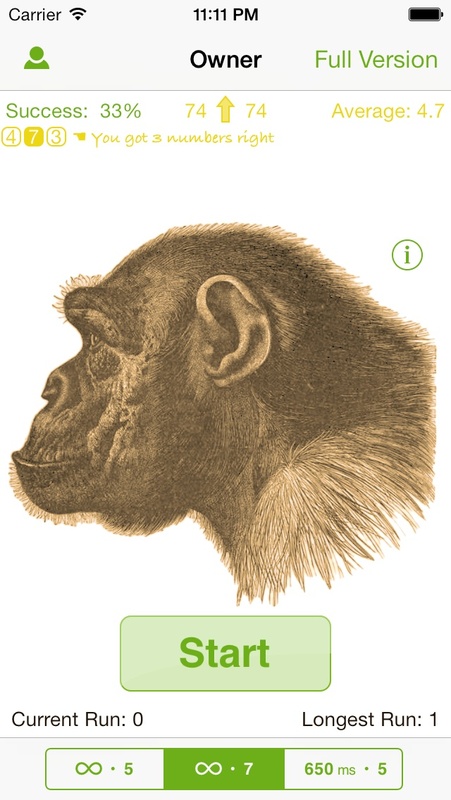 Can you keep up with the chimpanzee Ayumu? 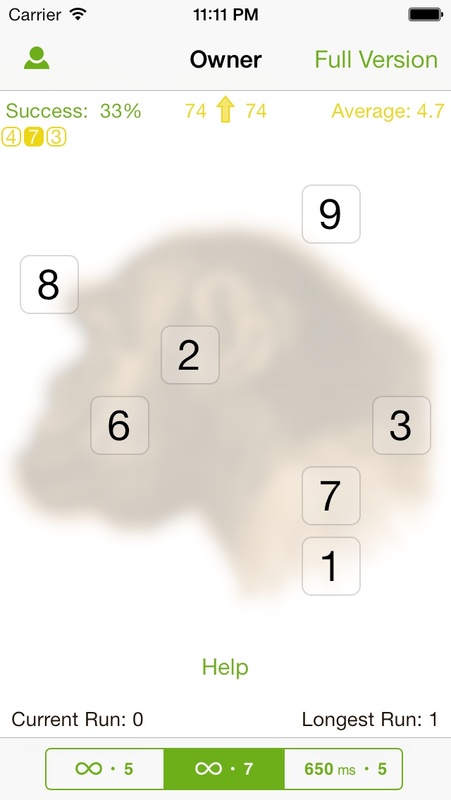 You have to memorize the positions of up to nine numbers within a very short time span. The chimpanzee Ayumu accomplishes this masterfully, even if he has seen the numbers for just 210 milliseconds. The human test persons undergoing the same test performed worse. What about you? What can you grasp with a glance? The Lite version allows to start with a simple setting for hiding five or seven numbers only when the first one is touched. In addition there is a setting where five numbers are hidden after 650 milliseconds. Note: The full version offers settings with 5, 7 and 9 numbers which can be combined with shorter time spans (down to 430 and 210 milliseconds just like in the original experiment). The Lite version does not save them, though. 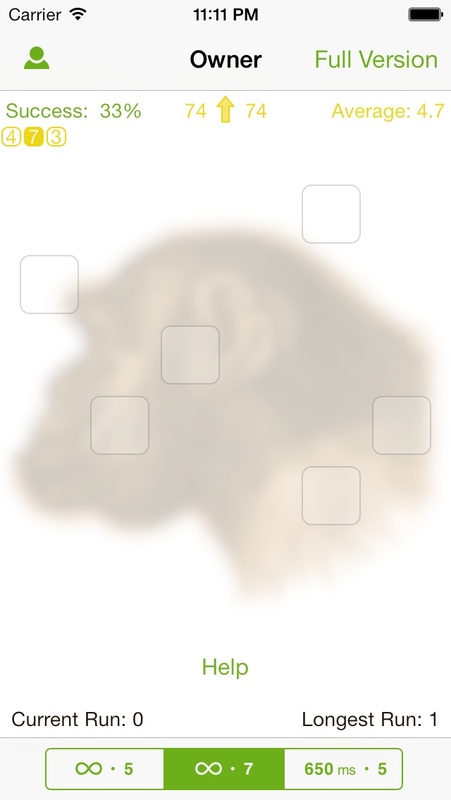 The application is based on real trials with chimpanzees which were performed in 2007 in Japan. important bugfix: the settings buttons at the bottom of the screen didn’t function at all! bugfix: the preview for 9 numbers shown for 210 ms in the full version info screen did not function. bugfix: the help texts for the statistics in the game view’s corners were missing (just an unhelpful white view was shown when touching one of the corners). bugfix: landscape orientation had been enabled by mistake (and therefore looked broken until rotated back). New shiny high resolution icon (high resolution graphics for Retina displays are still limited to the full version, though). What's in the Full Version? Shorter Delays: Down to 430 ms and 210 ms just like in the original experiment. More Numbers: 5, 7 and 9 numbers combinable with all delays. Game state is saved: The last 1000 trials of each player are saved. Statistics: View your progress graphically in a chart. Player Management: Add, delete and rename up to ten players. Retina Display: High resolution graphics on Retina display (since version 1.1). Best Values: Best values for success rate and average correct touches are remembered and displayed in the statistics view (since version 2.0). iPad: Universal App with specially adapted iPad version (since version 2.0). Try to remember the positions of the numbers. They will get hidden after the selected time span (or when touching the first number if no time span is selected). 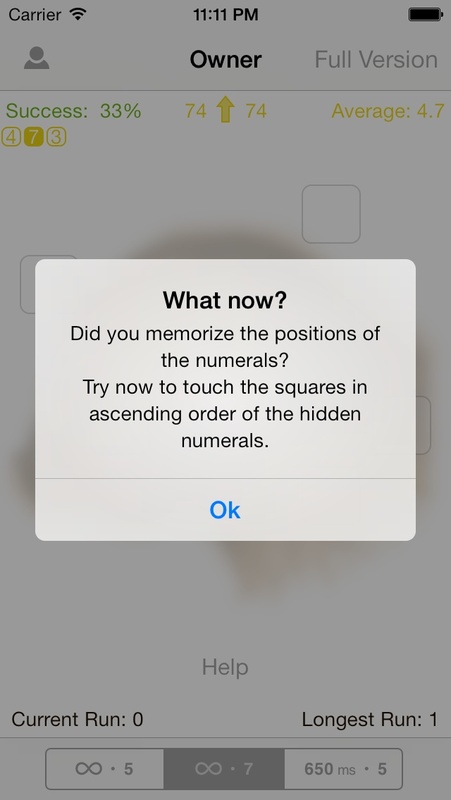 Now touch the squares in ascending order of the hidden numbers. 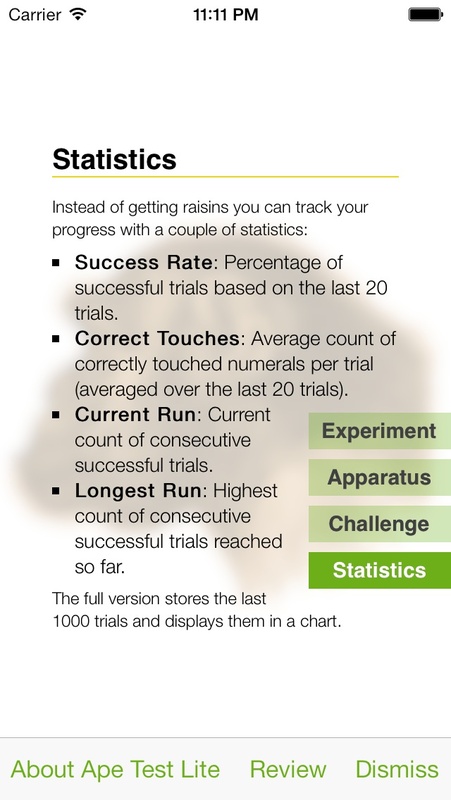 Description of the statistics tracking your progress.